We’d love your help. Let us know what’s wrong with this preview of The Price Of Civilization by Jeffrey D. Sachs. To ask other readers questions about The Price Of Civilization, please sign up. This is by far the best book on current US economics and political theory that I have read. Detailed, clear and persuasive. Starts with an economic history of the past 50 years to show how we have gotten here, and then details why the current political process and economic policy are wrong-headed and destined (if we don't change them) to lead to a serious decline in America's leadership role in the world, and its standard of living. Every member of Occupy Wall Street should read it so they know This is by far the best book on current US economics and political theory that I have read. Detailed, clear and persuasive. Starts with an economic history of the past 50 years to show how we have gotten here, and then details why the current political process and economic policy are wrong-headed and destined (if we don't change them) to lead to a serious decline in America's leadership role in the world, and its standard of living. Every member of Occupy Wall Street should read it so they know what they are protesting for, and about. Every Tea Party member should read it and reflect on how realistically to achieve their goals of smaller government, a balanced budget and less taxes. In fact every American should read it and consider where we are, how we got here, and what to do about it. Unless we take its message to heart, we are in for a very rough and disappointing ride as a nation. The first half of this book is scary. Jeffrey Sachs seems to list all of the ills of our civilization. The state of politics, our economy, national values and consumer trends are falling into a deep dive. This book puts all these trends together, and it is very depressing. Much of this book is about the shared social responsibility of the wealthy, and of corporations. Sachs is strongly against the huge political influence of large corporations. He is definitely a liberal--but that does not mean h The first half of this book is scary. Jeffrey Sachs seems to list all of the ills of our civilization. The state of politics, our economy, national values and consumer trends are falling into a deep dive. This book puts all these trends together, and it is very depressing. Much of this book is about the shared social responsibility of the wealthy, and of corporations. Sachs is strongly against the huge political influence of large corporations. He is definitely a liberal--but that does not mean he is pro-Democrat party. He finds the Democrats to be the cause of almost as many problems as Republicans. The parties are actually very similar, as both are run by the wealthy and by corporations. The second half of the book is a fountain of suggestions for how to improve our nation. He very much would like congressional terms to be increased, as two-year terms are too short. Sachs shows how our national deficit is increasing every year, and that there is not all that much room for reduction of spending by cutting out waste. He shows how much additional revenue is required, and lists a number of tax increases to help make ends meet. Sachs acts as if he is exposing problems for the first time, but actually, he's ended up preaching to the crowd. Not really sure who'll read this and find out new things about problems in America, although he is a master of using graphs to try to prove his arguments. The biggest problem here is the disconnect between parts I and II. Part I is spent explaining why and how the system (systems?) is broken, and part II is Sachs's advice on fixing it. But the solutions often seem to gloss over politic Sachs acts as if he is exposing problems for the first time, but actually, he's ended up preaching to the crowd. Not really sure who'll read this and find out new things about problems in America, although he is a master of using graphs to try to prove his arguments. The biggest problem here is the disconnect between parts I and II. Part I is spent explaining why and how the system (systems?) is broken, and part II is Sachs's advice on fixing it. But the solutions often seem to gloss over political realities. In part I, Sachs complains about the policies that make sense from his macroeconomic perspective not being passed, and attributes it to Congressional fealty to big corporate donors. Then, in part II, he recommends political and economic solutions. How are these policies supposed to be put in effect when the system is at the mercy of the big corporations, as he alleges? While I don't disagree with him totally, I think his time spent abroad with other governments has made him forget how politics in America works. With this in mind, I wonder how realistic any of his policy advocacy is. Now I understand what a political economist is. Jeffrey Sachs is an outstanding example of one. This is a superb analysis of the current state of the US economy with an impressive list of suggestions on how to fix it. Prof. Sachs pulls no punches in his critique of both ends of the political spectrum and the damage that they have done to the American political system. He likewise indicts the media and the American people for their short attention span and their dangerous habit of kicking the sig Now I understand what a political economist is. Jeffrey Sachs is an outstanding example of one. This is a superb analysis of the current state of the US economy with an impressive list of suggestions on how to fix it. Prof. Sachs pulls no punches in his critique of both ends of the political spectrum and the damage that they have done to the American political system. He likewise indicts the media and the American people for their short attention span and their dangerous habit of kicking the significant issues down the road, rather than dealing with them. His thorough-going explanation of the true nature of the threat of the deficit (hint: no deficit is not the answer)plus his analysis of current spending are right on target. He clearly identifies the logically opportunities for spending cuts while arguing for the need for significant revenue enhancement as well. Most compelling is his argument that if we want the good things of civilization, we all need to be prepared to pay for them, most especially the wealthy in much greater proportion than they have been. I agreed with his emphasis on where we need to increase - that's right, increase - spending: education, research, infrastructure, a forward-thinking energy policy. Our priorities have gotten seriously out of whack in the last 30 years and we need to reorient them to the point where we can all (all - not just the wealthy) enjoy the fruits of our labors. Prof. Sachs is direct and explicit in his criticisms, so if you are easily offended or seriously on one extremity or other of the political spectrum, you probably will be offended or not agree. But those of us with a balanced view of the world and an eagerness to find workable solutions should all hail this book as a work of genius. And pass it along to our less-enlightened friends. In this incisive and prescient presentation, Jeffrey Sachs of Columbia University and an renowned and highly respected international economist, presents his analysis of the economic and cultural challenges that the US is currently facing, and he courageously and convincingly provides recommendations for addressing those concerns. In Part I, he diagnoses America’s current economic crisis, detailing how prosperity has been lost, the free-market fallacy, and Washington’s retreat from a sense of publ In this incisive and prescient presentation, Jeffrey Sachs of Columbia University and an renowned and highly respected international economist, presents his analysis of the economic and cultural challenges that the US is currently facing, and he courageously and convincingly provides recommendations for addressing those concerns. In Part I, he diagnoses America’s current economic crisis, detailing how prosperity has been lost, the free-market fallacy, and Washington’s retreat from a sense of public purpose, all of which are reflected in a deeply divided nation that is too often unaware of the challenges of globalization and how the situation is rigged toward the affluent and those in power. Society in the main has allowed itself to be too distracted to notice or understand the true roots of what is occurring. In Part II, “The Path to Prosperity,” Sachs discusses the need for a more mindful society and how prosperity can be regained, and he probes how a truly successful and humane society can be paid for and how a political system can be made more effective, fair, and sustainable. Finally, he addresses the demographic and cultural changes that lead him to a sense of modest optimism. These days there are plenty of social-political jeremiads in print, and I feared that this might be no different from most that clearly articulate the problems and the national-cultural dilemmas in which we find ourselves today without providing anything approaching a do-able program for changing course. I was wrong. Sachs, whose credentials are impeccable, whose writing is straightforward, and whose data are convincingly presented, has provided recommendations that might conceivably be able to be accomplished. It is impossible, of course, to overestimate the resistance of those parties of the status quo who benefit in the short run from the situation as it now stands, but Sachs convincingly argues that demographic and social trends are on the side of meaningful progress, if time does not catch up with us too quickly before those trends can actualize the changes so desperately needed. I am left, as I often am, with a sense of personal impotence and uncertainty about what I as an individual can do to help, but on even such a micro level Sachs has words of encouragement and possibility. This is a book that I shall recommend to my own kids and to others whom I encounter who are interested in and concerned about these issues. 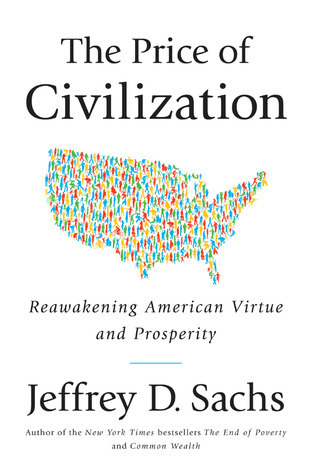 (Opening paragraph) "At the root of America's economic crisis lies a moral crisis: the decline of civic virtue among America's political and economic elite. A society of markets, laws, and elections is not enough if the rich and powerful fail to behave with respect, honesty, and compassion toward the rest of society and toward the world... Without restoring an ethos of social responsibility, there can be no meaningful and sustained economic recovery." Mr. Sachs writes passionately and persuasively. "A society of markets, laws, and elections is not enough if the rich and powerful fail to behave with respect, honesty, and compassion toward the rest of society and toward the world." No argument there. We've certainly seen enough lately of the results of the rich and powerful failing to behave with respect, honesty, and compassion. (Not that the poor and powerless are necessarily any more virtuous by nature of their lack of funds and influence, but moral failings in high places certainly seem to have wider consequences.) We are living, he claims, through a "new Gilded Age" where there is "an inequality of income and wealth unprecedented in American history" and while he has no quarrel with wealth itself, he does with poverty. Mr. Sachs advocates "government planning, government investments, and clear long-term policy objectives that are based on the society's shared values." Yes! So many of our ills today are due to the short-term blinders that are handed out to many, if not all, business executives and legislators that only look at far as the next quarter's profits or the next election, which comes around every two years. When only short-term results are rewarded, guess where the focus is going to be? He decries the lack of consequences for those who participate in dishonest behavior, and is particularly harsh on those who lie and cover up failures, errors or mistakes and points to the almost constant focus on PR rather than "truth" as an evidence of this loss of virtue in business and public life. And I got plain old angry reading about the details of Google's complicated system of corporate tax havens and tax shelters where money is funneled through Ireland and Bermuda with the knowledge and cooperation of the Internal Revenue Service in order to avoid paying taxes on their profits. Mr. Sachs is not anti-capitalism at all. In fact, he emphasizes that market forces are well equipped "to allocate most goods in the economy." However, he is firm in his belief that government is necessary to reign in some of capitalism's most short-sighted and self-interested tendencies. Governments, he says, should have three aims when working in conjunction with the free market - "efficiency (prosperity), fairness (opportunity for all) and sustainability (a safe environment for today and the future)" - which free markets can not obtain on their own. "A combination of market forces and government actions is needed to achieve these three simultaneous goals." Government should step in to promote market efficiency "when supply and demand stop functioning effectively." He illustrates situations where this occurs including public goods, or when "economic logic calls for a single supplier," for example, for highways, police, fire department, a court system, etc. And also "when producers cause adverse spillovers to the rest of society," such as pollution. Interestingly, he also argues this to be the case for scientific research. "One of humanity's most important activities - scientific discovery - needs to be promoted in ways other than the pure profit motive." Another instance when government should be involved "to help regulate the marketplace [is] when information between buyers and sellers is 'asymmetric.'" He quotes Keynes, Samuelson, Hayek and Friedman liberally in support of this mixed economy. Economic fairness should be another role of government, Mr. Sachs states. While "the marketplace does have some elements of basic fairness...the fairness of the marketplace should not be exaggerated. Many people are simply unlucky." Elements outside of an individual's control, such as foreign competition, disabilities, and natural disasters, can have drastic effects on that individual's prosperity. Mr. Sachs points out that "just as there are many people who don't deserve their poverty, there are many others who don't deserve their wealth." This fairness applies to "the ways that government treats the citizenry" including the rule of law, due process, and levying taxes in a "just" and "equitable" way so that even the poor have the "basic resources...such as food, shelter, safe water, and access to health care." He includes programs such as Social Security in this as "distribution of income across generations." This concept rolls neatly into the third aim of government involvement in markets: sustainability, or "fairness to the future." As stewards of the earth's resources for later generations, the government should intercede to protect their interests in a clean environment. Ronald Reagan is not held in high esteem in this book. Mr. Sachs feels that Mr. Reagan's call for "smaller government" because "government is the problem" completely missed the boat on the actual causes of the struggling economy in the 1970s and, in fact, "turned the levers of power over to the highest bidder." Mr. Sachs labels Mr. Reagan's legacy as "a new antipathy to the role of government, a new disdain for the poor who depended on government for income support, and a new invitation to the rich to shed their moral responsibilities to the rest of society." Rather than "unleashing...entrepreneurial zeal" with tax cuts for the wealthy, Mr. Reagan succeeded in releasing "a lot of pent-up greed...that infected the political system and...still haunts America today." Alan Greenspan is also the target of much of Mr. Sachs's ire. "By treating the United States as a closed economy, he continually overlooked the severe risks of his own policies and thereby helped stoke several financial crises, including the megameltdown of 2008." A major lesson of Greenspan's reign is that "ignorance or neglect of globalization repeatedly comes back to haunt us." "Our greatest national illusion," Mr. Sachs states, "is that a healthy society can be organized around the single-minded pursuit of wealth." Rather, the "ultimate purpose of economic policy [is] the life satisfaction of the population." He goes on to illustrate the virtues of moderation drawing on both Buddha and Aristotle for support of what he terms a "mindful society" which is "one that promotes the personal virtues of self-awareness and moderation, and the civic virtues of compassion for others and the ability to cooperate across the divides of class, race, religion, and geography." To that end, he concludes the book with suggestions for how individuals and our society as a whole can become more mindful, virtuous and prosperous. Despite the overweening forces of corporations, special interests, the media, and self-serving politicians, eventually, Mr. Sachs lays the responsibility right in our laps. "The problems of America begin at home, with the choices we are making as individuals." We have succumbed to "a shocking array of addictive behaviors (smoking, overeating, TV watching, gambling, shopping, borrowing, and much more) and loss of self-control)." It is up to each citizen to educate him- or herself and hold our elected officials to a higher standard. "The public will have to exercise a new and higher level of political responsibility. Special interests dominate our politics not only because they have more money but also because much of the general public has disengaged itself from public deliberations." Ultimately, Mr. Sachs asserts that we need to increase our mindfulness and realize that "our well-being depends fundamentally on our recognizing and nurturing our basic duality: as individuals, with distinctive tastes and aspirations, and as members of a society, with responsibilities to and values shared with others." In 1996, the Telecommunications Act in the US completely deregulated the mass media. Formerly, under the FCC, the rules required some programming not supported by advertising and required alternative points of view (the Fairness Doctrine http://en.wikipedia.org/wiki/Fairness...). It also limited ownership to prevent monopolizing local access through joint control of print, radio and TV. All that is gone and we are left with corporate media giants like Disney, Comcast, Westinghouse, Viacom, Time-Warner, and News Corporation. Sachs concludes Part One of the book with this: “We are a technology-rich, advertising-fed, knowledge-poor society”. In order to reduce the deficit, cuts in spending are proposed, especially by Republicans, but also by Democrats. Favourite targets are foreign aid and government waste. Sachs analyzes these and demonstrates that the proposed savings would be a very small percent of GDP. (Foreign aid = 0.2 percent of GDP; waste, identified by the National Commission on Fiscal Responsibility and Reform = 0.6 percent of GDP http://en.wikipedia.org/wiki/National...). I wanted to take Jeff Sachs's course in college, but he was never there to teach it. He was too busy saving the world, and the Eastern Block countries in particular, to turn up for his fall semester class in International Economics. If this book is any guide, that's quite lucky for me. The book has two parts. In the first, all 175 pages of it, the author exposes what's wrong with the world. In the second part, a mere 90 pages, he offers his solutions. One star is probably too generous for part one. I wanted to take Jeff Sachs's course in college, but he was never there to teach it. He was too busy saving the world, and the Eastern Block countries in particular, to turn up for his fall semester class in International Economics. One star is probably too generous for part one. If it had been written by a Zen Buddhist monk, I'd have been more lenient, I might even be half-impressed. But if this is the best one of the rock star economists of our planet can do, we're in deep trouble. I'm rather liberal in my leanings, this ought to have been right up my alley. Instead, I found myself thinking I need to take my losses and start reading something else. EVERYBODY knows there's a case to be made for government, everybody knows CEOs are overpaid, everybody knows politicians can be bought, and quite frankly nobody really agrees with some of the weirder stuff Sachs talks about. I know that giants like John Kenneth Galbraith shared the author's aversion for advertizing, but nine out of ten people you ask would not put the advertizing model in their top 100 problems with today's capitalism. Hell, I like ads! And I have no patience for a globetrotting professor telling me I need to worship Gandhi or Buddah. Not if the book is advertised as an economics book. Jeff Sachs has his place in the pantheon of economists, but for my money (which I forked out to buy this opus) he's a crumby philosopher. But I finished part one of the book and got to part two and my persistence was rewarded. First, somewhere around page 180 (give or take 20 pages, I haven't got the book here) the author tells you what "the price of civilization" is. It's taxes. Hats off to him for keeping that under wraps that long. Even better, his laundry list of solutions / propositions / answers to the world's ills is thorough and clearly presented and, frankly, at odds with the weirdness of the first part of the book. It comprises a list of necessary areas where we need to spend more, places where we can make cuts and ways to raise revenue, all with estimated numbers attached. I'd give four stars to the second 90 pages, with the fifth star missing because he does not back up the proposals with anywhere near as much oomph as they deserve. "I like to pay taxes," said Oliver Wendell Holmes. "With them I buy civilization." Economist Sachs (Earth Institute, Columbia) says the U.S. badly needs a new governing majority with Holmes's attitude. At present, however, it appears things are going the other way. Surveying the American civic landscape, Sachs finds the commitment to public values fast eroding, with predictable results: a widening income gap, huge inequities of opportunity, an increasingly divided nation, a "corporatocracy" conce "I like to pay taxes," said Oliver Wendell Holmes. "With them I buy civilization." Economist Sachs (Earth Institute, Columbia) says the U.S. badly needs a new governing majority with Holmes's attitude. At present, however, it appears things are going the other way. Surveying the American civic landscape, Sachs finds the commitment to public values fast eroding, with predictable results: a widening income gap, huge inequities of opportunity, an increasingly divided nation, a "corporatocracy" concerned only about short-term profits controlling the levers of power at all levels, and a feckless government unable to engage the nation's or the world's problems. Sachs's view is that this is a fairly recent development. At least through the presidency of Carter there was a sense that large-scale problems could find public solutions. But when globalization threatened American economic hegemony, the American response was and continues to be an endorsement of Ronald Reagan's prescription that government is the problem and markets are the answer. The problem, says Sachs, is that this extreme turning away from government as being part of a solution fails to recognize what most economists (including such laissez-fairists as Adam Smith and F. A. Hayek) understand, which is that where fairness, efficiency, and sustainability are desired, a governmental role is essential. Markets under-perform when it comes to providing such public goods as infrastructure, education, and scientific research. Sachs lays out a comprehensive platform for reform, including an end to the federal deficit and the power of corporate lobbies. The solution to the deficit will require that Americans (the wealthier ones, anyway) accept higher levels of taxation. But why not? Scandinavians pay higher taxes, and self-report higher levels of happiness than Americans. Since the Boomer generation is largely responsible for getting us into the present mess, Sachs places his hopes in the Millennial generation. Also, he doesn't expect either major party to accomplish the change necessary without a considerable nudge from a large third party. The author prescribed not a few insights in favor of a just social system and a more effective governance. These prescriptions are penetrating and illuminating , but not penetrating enough to pierce a hole to cure all the predicaments us facing. The prescription is good even to the plain eye. The problem is "Will these methods be fully completed by the government"? This plunged me into a strong suspicion. However, these analysis and prescriptions can provide some food for thought for other gove The author prescribed not a few insights in favor of a just social system and a more effective governance. These prescriptions are penetrating and illuminating , but not penetrating enough to pierce a hole to cure all the predicaments us facing. The prescription is good even to the plain eye. The problem is "Will these methods be fully completed by the government"? This plunged me into a strong suspicion. However, these analysis and prescriptions can provide some food for thought for other governments. The Seven Habits of Highly Effective Government could be reference for other nations in accordance with their practical conditions. Restore public management and Decentralize. Jeffery Sachs, an economist at Columbia University, is worried about the state of America. He sees a nation in which incomes for many have been stagnant since the 1970s in real (inflation-adjusted) terms, increasing income inequality, a chronic budget deficit and resulting increase in government debt, increased poverty, crumbling infrastructure, and an unwillingness to deal with climate change. The Price of Civilization is a well documented book with end notes and a list of sources consulted, as well as a guide to further reading. The body of the text contains many charts, often comparing the United States with other wealthy nations. Sachs also cites much opinion survey data. Sachs appears to be an unusual figure, a liberal non-Keynesian. He appears to believe that attempts to stimulate economic growth through increased government deficit spending will fail. Although I was aware of the converse of Sachs, conservative Keynesian economists such as Gregory Mankiw at Harvard and John B. Taylor at Stanford, Sachs was a new category in my taxonomy of economists. Sachs blames our lack of response to these problems indirectly to a public too distracted by mass media to pay serious attention to politics, and more directly to the dominance of a small number of powerful lobbies representing the financial, health care, and defense industries. Other contributing factors include the Civil Rights movement of the 1960s, which resulted in the Republican Party becoming dominant in the Sunbelt, and the relative increase in the population of Sunbelt states. Apparently the main way out of this sad state of affairs is for Americans to bestir themselves and become better women and men, focusing less on accumulating material goods and more on the common good. Fortunately for Sachs, the survey data he cites indicates that they share his values. I have some doubts about this, partly because the views of voters rather than the general public is more important and not necessarily the same, and partly because I suspect people are rather more willing to say they are in favor of government spending when they are not confronted with the bill, In any case, it appears that the increased “mindfulness” of the American population is supposed to result in public campaign financing, the provision of free media time, ban campaign contributions from lobbying firms, and shut the revolving door from government to interested firms (pages 244-245.) I wonder how much of this would be deemed constitutional by the Supreme Court. Sachs says he has been told in the past in his work in other countries that such changes were politically impossible (and were then enacted) but I wonder how many of those nations were under the gun of the International Monetary Fund, World Bank, or some other creditor. His main budget policies would appears to be a reduction in military spending, an increase in domestic discretionary spending on research in renewable energy and on maintaining and improving our infrastructure. He would change the Obama health care legislation by either adding a government plan or moving towards a single payer plan – I’m not clear which. Other goals would be to increase the percentage of Americans in their late 20s with a bachelor’s degree to 50% by 2020, improving test scores (I assume for high school students) relative to other rich nations, and bringing unemployment down to 5% by 2015. To do all this, federal taxes would increase from about 18% of gross domestic product (GDP) to about 24% of GDP. Part of the increase in taxes would be used to funding programs at the state and local level, as Sachs believes that leaving taxation to local or state governments encourages a “race to the bottom” among these entities. Sachs does not believe that the Medicare or social security programs offer much scope for budget cutting without harming the beneficiaries. I have reservations about some of Sachs goals and themes. I have doubts about his goal of increasing the percentage of people with bachelor’s degrees and more importantly about his proposal to do so by increasing financial support for students. From my reading of Crazy U: one dad’s crash course in getting his kid into college by journalist Andrew Ferguson, it would appears that increasing financial aid merely results in a quick dollar for dollar increase in tuition, leaving students where they were before. From my reading of Launching the Innovation Renaissance: a new path to bring smart ideas to market fast by the economist Alex Tabarrok, it would appear that we have gotten more people with bachelor’s degrees in the last few decades, but they have been in non-technical areas which don’t make the recipients of these degrees much better off financially and which don’t contribute to increased technical innovation, a useful way of increasing economic growth. Therefore, I don’t think that merely having more people go to college is useful. Given our poor high school graduation rate, discussed in Tabarrok’s book, I think improving that would be a better first step. I also suspect that Sach’s support of government supported job training is misplaced in the American context, where actual training seems rather uncommon; see Gordon Lafer’s the job training charade. Sachs places much hope in the Millennial Generation, those between 18 and 29, supporting his policy views. He cites polling data suggesting that they are more tolerant on issues such as gay rights, and that they support “a bigger government providing more services” (p. 254.) He also notes that the proportion of African-Americans and Hispanics is larger in this age group. Aside from the last point, which may offer some hope for Sachs to the extent that African-Americans and Hispanics are more likely to be poor and thus may believe that they are more likely to benefit from government programs, I find this argument unconvincing when it comes to economic issues. My impression is that people are willing that they are in favor of something (such as steps to ameliorate climate change) as long as they aren’t actually faced with the bill; then they oppose such measures. This is one of the finest books I have read in diagnosing our current economic, social, and political crisis, but it is even more important as it contains suggestions for changing our current dismal and deteriorating condition. What follows are extensive excerpts from this book in Sachs’ own words, with the page(s) from which they are taken indicated in parenthesis. As Goodreads sets a maximum of 20,000 characters, some of my review was cut off. • At the root of America’s economic crisis lies a mo This is one of the finest books I have read in diagnosing our current economic, social, and political crisis, but it is even more important as it contains suggestions for changing our current dismal and deteriorating condition. (3.0) Little to unrealistic in proposals. And a little less academic/objective in his tone. Preferred reading Piketty, cover similar ground. I did make a lot of notes and highlights though, so there's stuff worth discussing here. I like to read books that challenge my opinions, and The Price of Civilization definitely did that. I felt immediately that I could trust Sach's credentials; he's a clinical macroeconomist who has spent his career advising foreign governments about how to build and improve their economies. He states that in his early years he felt that America was doing well and didn't need his expertise, but our recent financial crises have changed his mind. This book is basically his diagnosis and prescription I like to read books that challenge my opinions, and The Price of Civilization definitely did that. I felt immediately that I could trust Sach's credentials; he's a clinical macroeconomist who has spent his career advising foreign governments about how to build and improve their economies. He states that in his early years he felt that America was doing well and didn't need his expertise, but our recent financial crises have changed his mind. This book is basically his diagnosis and prescription for what ails our country's economy. He is thorough, detailed, and convincing! I now believe (though I'm not excited about paying them) that my (and your!) taxes need to be raised now or we will all regret our fiscal irresponsibility in the future. We need to have public funding for election campaigns, regulations on the revolving door between political appointees and lobbyists, etc etc etc. What we really need is Sachs as the president's chief fiscal advisor, though I don't think he wants the job. He knows the reality that special interest groups run the country and will resist doing anything for the greater good. He knows that both political parties are more interested in maintaining their own immediate power than making sustained progress. Unfortunately the patient is non-compliant with the doctor's prescription. I don't claim to be an expert on economic policy, but I'm trying to at least have an opinion based on real knowledge, rather than reactionary emotion. Fantastic synopsis of the current political and financial state of the US, although the ironic part of Sachs' analysis is that the folks who NEED to read his book before the next election, are still stuck in front of the TV watching distorted media news stations as their primary source of information. Sach's proposals are too idealistic for practical adoption. The by-gone era's he nostalgically recalls, the New Deal years and the Kennedy years, were the result of a generation devastated by two W Fantastic synopsis of the current political and financial state of the US, although the ironic part of Sachs' analysis is that the folks who NEED to read his book before the next election, are still stuck in front of the TV watching distorted media news stations as their primary source of information. Sach's proposals are too idealistic for practical adoption. The by-gone era's he nostalgically recalls, the New Deal years and the Kennedy years, were the result of a generation devastated by two World wars and a massive economic Depression. I also felt he puts too much faith on Millennials, who are apathetic to politics and are even more susceptible the same fate as their parents in getting sucked into the media machine of information or through social networks. This questions poses an important question - how can American again become a global economic leader? - and it gives clear answers to this question. The first half of the book diagnoses the causes of America's economic state, chief among them the influence of corporations on government. The second half of the book are proposed solutions, based on goals that can be measured. What makes this book so appealing is the way Sachs keeps economics connected to the pursuit of happiness. After all, if the ta This questions poses an important question - how can American again become a global economic leader? - and it gives clear answers to this question. What makes this book so appealing is the way Sachs keeps economics connected to the pursuit of happiness. After all, if the target of good economic management is not happiness, then why bother? He teaches readers to take personal responsibility for achieving economic success and argues for more government involvement. Jeff Sachs is a world-renowned economist who turns his attention to the financial crisis and other issues that the United States faces. He describes the responsibility that every American has to their country and to the rest of the world and how we have recently dropped the ball regarding those responsibilities. All is not lost, though. Sachs goes on to suggest specific actions, both societal and political, that we can pursue to increase the level of fiscal responsibility, standard of living, an Jeff Sachs is a world-renowned economist who turns his attention to the financial crisis and other issues that the United States faces. He describes the responsibility that every American has to their country and to the rest of the world and how we have recently dropped the ball regarding those responsibilities. All is not lost, though. Sachs goes on to suggest specific actions, both societal and political, that we can pursue to increase the level of fiscal responsibility, standard of living, and general prosperity among the citizens of our nation. This was not quite what I was expecting, but it's an excellent book. I was looking for a book to help me understand economics and the current economic situation of the U.S., and maybe the world. A tall order, but Sachs has a great reputation. This book does explain how we have gotten where we are economically, but not in a great deal of detail. He also covers political and sociological causes, then goes into solutions. However, his solutions are not very new, and I didn't get a good feeling for This was not quite what I was expecting, but it's an excellent book. I was looking for a book to help me understand economics and the current economic situation of the U.S., and maybe the world. A tall order, but Sachs has a great reputation. This book does explain how we have gotten where we are economically, but not in a great deal of detail. He also covers political and sociological causes, then goes into solutions. However, his solutions are not very new, and I didn't get a good feeling for how they could actually be accomplished. No concrete practical steps to take, rather some overarching pie-in-the-sky prescriptions. I completely agreed with the author's diagnosis of the US circa 2011 (growing wealth inequality coupled with the wealthy increasingly detaching themselves from any sense of the common good, combined with the pernicious influence of money in politics). The book fell flat, though, in his suggestions for improvement. They were big on the "what" (i.e., "reduce the influence of money in politics") but dramatically lacking in the "how".